RUSH: Ladies and gentlemen, Open Line Friday is a day of departures from the norm, and I would like to ask you to indulge me for just a moment on a local issue of great importance and mild to severe frustration to me. See, I live, as many of you know, on a beach on Palm Beach, Florida. And because of a series of ordinances (local, county, and state) for eight months of the 12-month year people who live on the beach have to turn off any light that can be seen from the beach. This is because sea turtles, which (or who) don’t start arriving until May, are said to be distracted by light. So what happens — and I have witnessed this on the beach one Memorial Day — it’s an amazing thing to watch. Giant sea turtles lumber out of the ocean, they trundle up to the beach, they dig the nest, they lay the eggs, and they trundle back to the ocean.There are some people supposedly out there marking where the nest is so that people don’t disturb it, and then some weeks later the hatchlings hatch and they burrow up out of the sand and they are supposed to go to the ocean where 90% of them end up as food, but 10% of them survive. Now, the theory from environmentalist nutcase wackos is that lights on the beach distract the hatchlings and cause them not to go to the ocean but inland. So, those of us who live on the beach have to turn the lights off. It’s a $250 penalty if we don’t and we have the Environmental Turtle Police wandering the beaches, and they report us. They go out there with cameras, little cheap Instamatic cameras and they’ll take a picture of your house. Of course these cheap little Instamatic cameras with no flash at night, the shutter opens wide for ten seconds and it does make your house look like a Christmas tree when all you have is one lamp lit inside.Then they come show it to you, ‘Hey, you’re violating the ordinance.’ From March 1st until October 31st, eight months: Darkness. Which poses a lot of problems. It adds to security costs. It makes it difficult to use outdoor facilities at night. By the way, I am totally devoted to preserving turtles, but I don’t think they arrive here ’til May, and the latest thing that’s happened is, now they are telling us that the arriving sea turtle mothers will not come ashore if they see light. Yet I have found pictures of actual turtles in broad daylight on beaches. We can’t put out the moon, and it’s up there every night even if there’s cloud cover. A sea turtle sees the light and the moon and tries to climb to the moon? What does it do? So it used to be that we had to turn the lights off in May and turn ’em back on in October, which is fine. That’s great. But eight months a year? 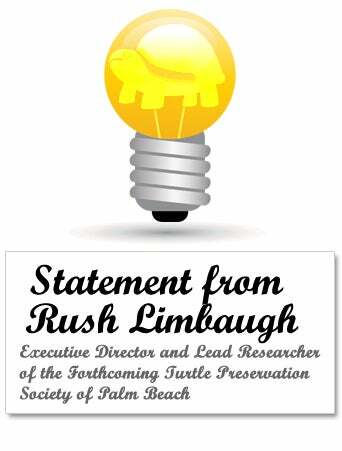 So I, ladies and gentlemen, am seriously considering founding the forthcoming Turtle Preservation Society of Palm Beach. The trolls out on the beach, why can’t they redirect the turtles when they’re out there? That’s an excellent question. The broadcast engineer said, ‘If these environmental trolls are on the beach, why can’t they just redirect the turtles when the hatchlings bop up?’ They’re not out there every night. They make weekly surveys to see who’s in compliance and who isn’t. I remember one night it was pouring rain, and my front gate buzzer rang. I wasn’t there, but the gate buzzer rang. The property manager goes and looks. It’s a cop out there with an environmentalist wacko claiming my house is lit up like a Christmas tree. The policeman didn’t even know what the ordinance was. We were in compliance, took him to the backyard and showed him. It was pure harassment. So I’ve looked into doing things but there’s three different groups: the county, the town, and the state. Well, that’s a… I’m being asked if they closed down South Beach. I don’t know. I have no idea if they closed down South Beach. I do know that I’ve seen people… I’ve been at parties where houses three feet from the water line on the beach were blazing. It’s not uniformly applied. We get this note from the town every February 25th reminding us. It has little turtle graphics all over it. ‘It’s time, once again, for beach residents to turn off the lights.’ I don’t think there’s been a sea turtle show up here (that was sane, anyway) in March. I’ve never heard of it. Before the environmentalist wackos got hold of everything, it was May 1st. You know, May 1st to October, fine and dandy. So I’m thinking of going to beach this week. I’ll take some bottles of P&eacute;trus and Haut Brion, some bread and cheese and just wait for them to arrive and say hi. ‘Heeey, we’re glad you’re back! Our lights are dimmed. We’re out here. We know you’re not going to be here for a couple months, but we wanted to get here early just to get a reserved seat for your return.’ Thank you for indulging me on this, folks. RUSH: Jennifer in Mooresville, North Carolina, welcome to the EIB Network. Hi. CALLER: I just wanted to tell you something about the sea turtles. I homeschool my son and we just finished a homeschooling unit on ocean life and we did a unit on sea turtles and everything and they actually don’t have very good vision. They’re actually nearsighted, so they can’t see far. I’m doubting that they could see the lights from your house anyway. RUSH: So they wouldn’t be distracted by the flash from a muzzle. CALLER: No, I don’t think so. You have to at least think about this. At least you’re making the environmentalist wackos happy by reducing your carbon footprint by not having any lights on. I’ve seen these animal shows where they show animals eating each other, these National Geographic shows, and I’ve seen little turtles, they bop out and the camera people, they can’t have lights, it’s nighttime. And they have lights on the beach, and here come the turtles, they come out and the cameraman is standing behind the sea turtles, not down toward the water, and the little baby hatchlings, they burrow up through the sand, and, bam, they make a dash for the ocean. They’re small and tiny and there’s a giant light illuminating the camera and showing us all this. I said, ‘Wait a minute, how come the light from the camera didn’t attract the turtles to the cameraman?’ Next thing they’re going to tell us is that we gotta turn the lights off year round simply ’cause Limbaugh was complaining. (interruption) Yeah, fence is up. It’s not just a fence. There’s a sea grate, there’s a dune, there’s all kinds of things. It’s an obstacle course out there. Land mines, I got it all. Well, I’m just teasing about the land mines. Anyway, Jennifer, thanks for the call.